Atelier is YOUR Student Government at Boston Architectural College. Atelier's mission is to foster communication between the BAC administration and the student body, to emphasize and promote professional and social aspects of student activities on and off campus, and to foster fellowship, cooperation, and unity between and among BAC students and organizations. -Current BAC Student who has been enrolled in degree programs at the BAC for a minimum of two consecutive semesters prior to taking office. -Be in good academic standing with a cumulative GPA of 3.0 or higher. -Must not be an officer of another recognized student organization on campus by the first day of the semester in which your term begins. -Must maintain Practice compliance. All modes of Practice assessment, such as skill level, must be up to date. -Candidates must not be delayed in the portfolio review sequence and schedule, meaning a student's path to graduation is not being delayed by the submission or re-submission of a portfolio. 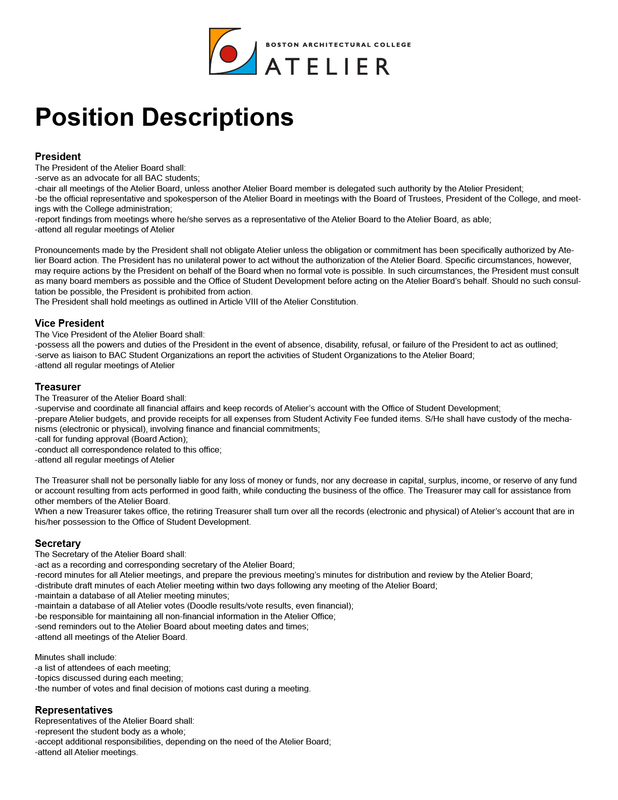 -President - Candidates for the President position must have served at least one full term as an elected member of Atelier prior to running for President. Please send your nominations to atelier@the-bac.edu. Nominations are due Friday, May 6, 2016 at 11am.